From Left to Right: Senator Bob Mensch, Representative Ryan Mackenzie, Dr. James Arcieri, Pastor of Community Bible Fellowship Church, Sergeant Major (Retired) Richard C. Hamp, Representative Justin Simmons, Representative Marcy Toepel. I was honored to host my 5th Annual Veterans Appreciation Breakfast on Saturday, November 12 at the Upper Perkiomen High School. More than 450 individuals attended the event which included veterans, veterans’ guests, exhibitors and speakers. Our Commonwealth is home to one of the largest veteran populations in the nation. I believe we have an obligation to all veterans to honor their service and contributions both in peace and war. This breakfast was a small token of our appreciation to our veterans. Veterans also enjoyed patriotic songs performed by the Upper Perkiomen High School Women’s Choir. Attendees were also able to obtain veteran identification cards from the Bucks County and Montgomery County Recorders of Deeds. This edition of the Mensch Report features my Senator for a Day Seminar that was held in the fall. The seminar allowed high school students from the 24th Senatorial District to role play as a State Senator in a mock legislative session. Students selected a committee based on their area of interest and debated and discussed the mock legislation that had been presented to them. High school students from Brandywine Heights, North Penn, Pottsgrove, Quakertown Community, Souderton, Upper Perkiomen, and the Perkiomen School attended the event, resulting in an impressive turnout of almost 100 students. Every year I am impressed with students’ enthusiasm to participate in this event. This educational experience gives students a unique hands-on experience with the legislative process and the many components associated with passing a bill. The feedback from the teachers is always positive and students often continue their discussion about the event at home and in their classes. The Network of Care website contains important information about the health and social service fields at the community level. The website includes a comprehensive listing of services for veterans, seniors, seniors with disabilities, children, individuals with developmental disabilities, domestic violence, foster care, prisoner reentry and more. For more information on these services, visit www.networkofcare.org, select “Pennsylvania”, and then select your desired “County”. 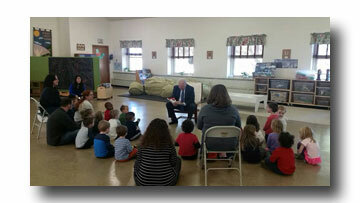 Senator Mensch visited the Upper Perkiomen Child Care Center, in Pennsburg, and read to the students in honor of the Center's 30th Anniversary. The Pennsylvania Department of Environmental Protection (DEP) has detected a new record-high level of radon and is once again encouraging state residents to test their homes for this radioactive gas, a leading cause of lung cancer. In October, a home in southern Lehigh County showed a radon level of 6,176 picocuries per liter (pCi/L), the highest recorded in the state. The U.S. Environmental Protection Agency (EPA) has set an action level for radon concentration in homes at 4 pCi/L. Homes testing above this level should have a radon reduction system installed. The National Toxicology Program, comprising the National Institutes of Health, Centers for Disease Control and Prevention, and Food and Drug Administration, classifies radon as a known human carcinogen. Scientists estimate that about 20,000 lung cancer deaths yearly are related to radon. It’s the leading cause of lung cancer in nonsmokers and second leading cause in smokers. Because of its geology, Pennsylvania is prone to high radon levels. Radon has been detected in all 67 counties, and about 40 percent of homes in the state have levels above EPA’s action level. In 2014, a number of homes in the southern Lehigh County area were found to have radon levels over 1,000 pCi/L. DEP certifies all radon testers, mitigators and laboratories doing business in the state, to ensure reliable results. For more information, including information on interpreting radon test results and finding a Pennsylvania-certified radon contractor, visit the DEP Radon Division web site or call 800-23-RADON (800-237-2366). The Pennsylvania Department of Transportation (PennDOT) began construction November 14 on an $11.7 million project to replace six structurally deficient culverts in Bucks, Chester, and Delaware counties. In addition, the project will rehabilitate four structurally deficient bridges in Bucks, Chester, Montgomery, and Philadelphia counties. The first bridge to move to construction is the Oxford Valley Road bridge over U.S. 1 in Langhorne Borough, Bucks County. The bridge will remain open while the contractor repairs structural damage which was caused by an oversized truck which struck the bridge. Construction is expected to be completed in June 2017. The project will be completed in three separate phases. The contractor also began work on the Route 663 (Layfield Road) bridge over the Perkiomen Creek in Upper Hanover Township, Montgomery County. Crews will rehabilitate the five-span structure by replacing the bridge deck. The Route 663 (Layfield Road) bridge will be closed and detoured until August 2017. During construction, Route 663 will be closed between Kutztown Road and Schoolhouse Road. The posted detour will take traffic over Route 29 (Gravel Pike), Route 100 and Route 73 (Big Road). Motorists are advised to allow extra time when traveling through the construction areas because slowdowns may occur. Finally, the contract includes concrete and sub-structure repairs on the Edenton Road bridge over Rattlesnake Run in Upper Oxford Township, Chester County, and the Torresdale Avenue bridge over Academy Road in Philadelphia. All work on the projects is expected to be completed in August 2018. 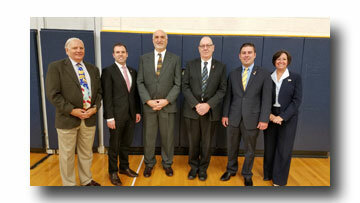 The project is financed with 100 percent of state funds through Act 89 (Pennsylvania State Transportation Plan). Motorists can check conditions on the roadways by visiting www.511PA.com.